Having drawn the away fixture, just missing out on a win, and bolstered by Mike Botteley on top board, I had high hopes for this fixture against the leaders in Division 2 last night particularly when they turned up without Graham Borrowdale. We comfortably out graded them but it was not to be! I failed to convert a middle game rated by Hiarcs at one point as 5 points better and when still just about level I left a Rook en prise to a pawn. My opponent Dominic Bartram has won 7 games in the league so far with one draw and no losses mostly against much higher rated opponents. He didn’t play the opening at all well but outplayed me in the ending. I think I was the first to fall but Joe soon followed. I can’t say much about his game against Josue Fernandez – one moment it looked fine and the next he and his opponent were analysing a mate. And to complete the rout of our middle order Richard had all his major pieces aiming at Colin Solloway’s King but got nowhere and ended up in a pawn and minor piece ending a pawn down against an opponent he had beaten twice before this season. 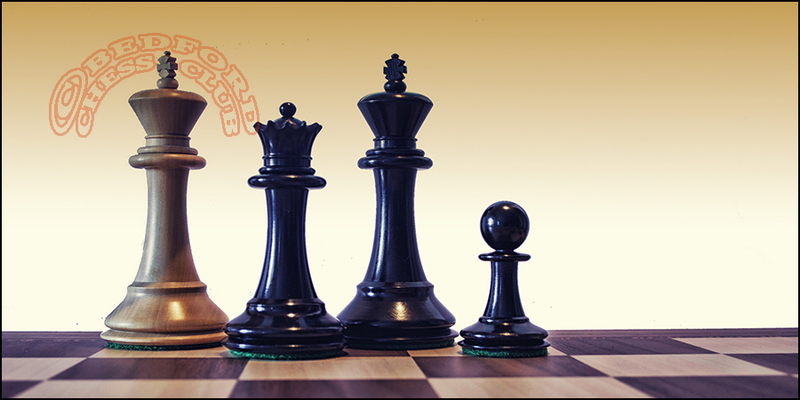 He battled on but could not resist a monstrous pair of connected passed pawns in the centre which hatched into a Queen – more than enough to squash Richard’s own hopes of promoting a pawn. Mike did the business on Board 1 against James D’Alexander converting pressure from a pawn advantage to a classic bank rank mate against the fianchettoed King position with Rook and Bishop. That just left Robert playing on board 5. (When did we last have a Club Div 1 Player on bottom board for the C team?). He didn’t have things all his own way but eventually managed to free his extra pawn to promote. So a very disappointing 2-3 defeat. Bedford A slipped up again and were indeed lucky to draw the match. First to finish was Mindaugas whose central control proved too much for Richard when short of time. Mindaugas was then dismayed to see his four colleagues under time pressure and with poor positions. On Board 3 Richard at first seemed to have better development but once his opponent had untangled his pieces it was Richard whose king was more exposed and he reached a lost Q and N v Q and N ending two pawns down. On Board 5 Andy had a promising position but once the ending came his pawns were scattered and weak. So we were 1-2 down with my game looking dire and Steve at best level in a rook ending after being a pawn up for most of the game. However, my opponent missed the killer punch (see game) and in the ending I even declined a draw in a level position in the hope of something good happening with both of us short of time. Eventually I thought I’d better not push my luck, agreed a draw, and then was delighted to see Steve pull off yet another trademark swindle with each side down to a rook and one pawn each. Steve’s h pawn was motoring and Francesca’s f pawn was going nowhere. Indeed the pawn soon fell and Francesca would have had to give up her rook when Steve’s pawn queened. The B Team headed to Milton Keynes for a tough encounter against their A Team. Despite being heavily outgraded, the match proved to be a competitive one. Marc faced Gary Kenworthy on board 1 and early on passed on the opportunity of castling and position his queen and rook on f1, g1 and h1. The position opened up on the queenside, but looked equal going into the endgame. However, a mistake in the time scramble led to the loss of the exchange, and finally the loss of a further piece. My game against Graham Smith was a fluctuating affair. A familiar tale of going wrong in the opening led to a cramped position. Graham opened up the position, but this allowed me to free my game and win a useful pawn. It looked like Graham was going to crash through against my king, but I managed to counter effectively, and had a won position when Graham lost on time. Qais always seemed to be in control against Adrian on Board 3. Out of the opening Qais has space, a better bishop v knight and pressure down the e-file. He then opened up the a-file and managed to win a pawn. Qais kept up the pressure in the ending and after simplifying to a rook and pawn ending and finally crashed through for a clinical win. Mike showed great restraint against Graham Borrowdale on 4. Faced with a quiet position Mike resisted the urge to try to force matters, and he ended up in a bad bishop v knight endgame. Graham’s attempt to put the knight on almost every square possible did not produce a breakthrough . A draw was offered and accepted, meaning that the team could not lose the match. On Board 5 Toby made his B Team debut against Robert Whiteside. An enterprising knight sacrifice on f7 for two pawns gave Toby a lot of play, but the knock-out punch was never quite there. Robert manage to simplify into an ending maintaining the bishop for two pawn advantage. Toby played valiantly to try to draw the game, even as both players fell short of time. However, the pressure finally told and as the pawns fell, the game was lost. Toby should not be downhearted and on this evidence will be a B Team regular before too long. Overall a 2.5-.2.5 draw was a good result, which moves the team a further point further away from the bottom.